Courtyard House Settlements are a uniquely West Penwith form of dwelling, which began to appear at the end of the Iron Age (about 500 BC) and continued to be occupied until the 4th-5th centuries AD (Romano-Ceornish period). Although there was doubtless an earlier settlement (which may have been more extensive) at Chysauster, the village as seen today probably dates from the later period of the 2nd-3rd centuries AD. There are eight houses remaining, forming two rows with a winding village street between them, and a ninth house to the SW. Although there are individual variations, each house consists of an entrance leading into a courtyard (which may have been unroofed) from which fans out a number of rooms, usually three. These consist of a round room (opposite the entrance), a long narrow room (to the right of the entrance) and sometimes a small round room as well. 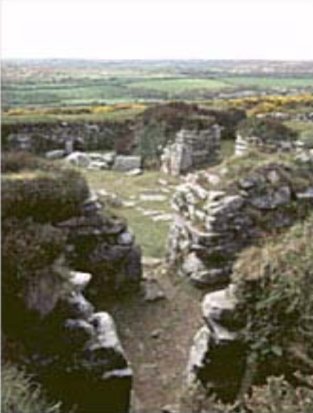 As at Carn Euny [see downloadable leaflet] and other Courtyard House Settlements, there was a fogou that now lies to the south of the houses, but was originally contained within the settlement. It was recorded in 1861 as running for at least 50ft up the hill, but is now has only 15ft left, and is not accessible. Outside the settlement there was an extensive field system, but much of this was destroyed by the landowner in 1984. Chysauster Courtyard House Settlement is one of the best-preserved sites in Cornwall, and an excellent example of a prehistoric village. It is in the care of English Heritage (closed in winter), who produce an informative and detailed leaflet about the site. There is an entrance charge. From Penzance take the B3311 road towards St.Ives. After about 2 miles at Badger’s Cross take a left hand fork and follow the road around to the car park at Chysauster. From here a path leads up to the site. Disabled access. The bulk of the material excavated from the houses consisted of pottery, but there were also fragments of slate and a large number of water-worn pebbles, mostly of cream-coloured quartz, which had been brought to the village, and may have had ritual significance. In 2003 a tiny (2cm across) copper alloy spoon was discovered, which may have been used for eating shell-fish.